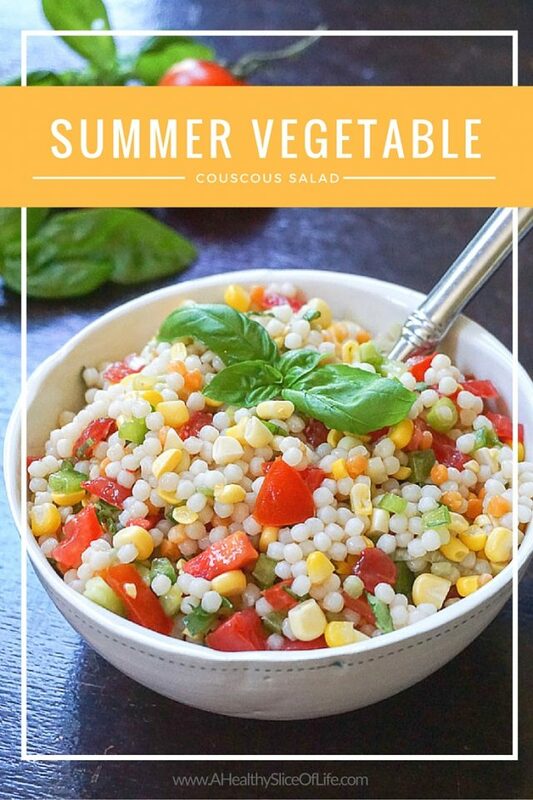 The tart zest of freshly squeezed lime juice brings together and brightens this hearty couscous and summer vegetable salad, making it the perfect side dish for grilling or a great option to double and bring to a backyard BBQ. Did it sneak up on anyone else? Or just me? Like usual, summer is here before I even realized it and the lazy days I envisioned haven’t quite unfolded yet. 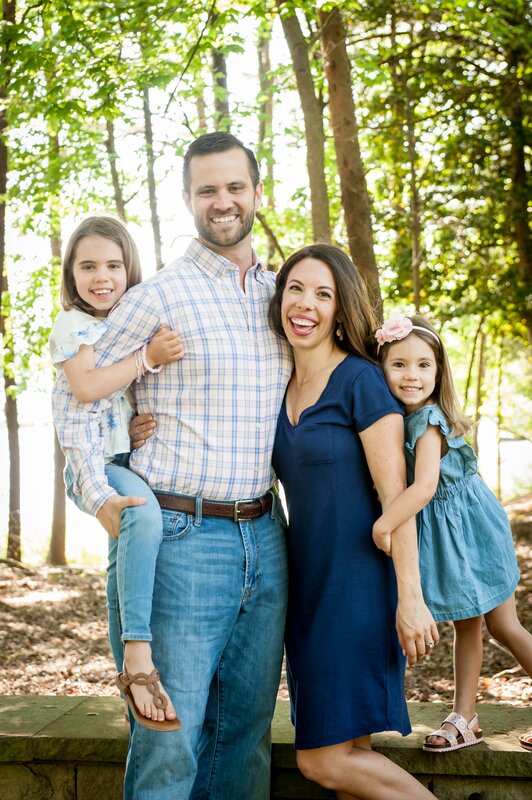 We’ve been a little crazy running from swim team to errands and I’m craving a slow down so we can savor these long, hot days with my girls. One thing we haven’t been skimping on though? Diving head first into the bright, fresh flavors of summer. As I’ve been experimenting with different summer flavor combos, I’ve fallen in love with the tart zest that lime adds to a dish. I’m finding myself squeezing it onto everything. It’s amazing that even with keeping most ingredients simple, adding lime really brightens up the flavors of each ingredient, creating a truly delicious end result. This summer salad shows off my lime obsession in the best way. 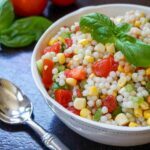 Combining the crispness of summer vegetables with the bubbly texture of Israeli couscous along with fresh basil, this side will be the biggest hit at a potluck BBQ or a healthy side dish that the entire family will devour. In the midst of my recipe testing, David and the girls ate every last bite, leaving us with a rather skimpy dinner of only grilled chicken. Note to self, next time I’ll double the recipe! 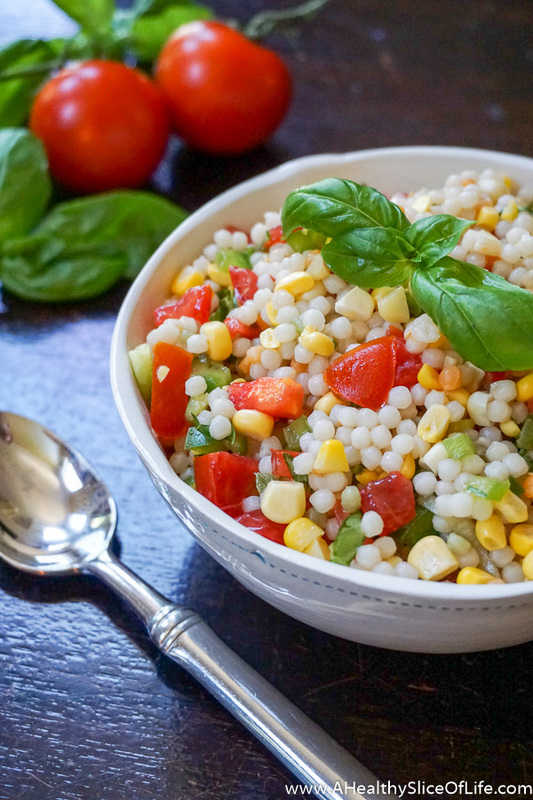 The tart zest of freshly squeezed lime juice brings together and brightens this hearty summer vegetable and couscous salad, making it the perfect side dish for grilling or a great option to double and bring to a backyard BBQ. Cook couscous according to the package directions. When done, transfer into a large mixing bowl to cool. 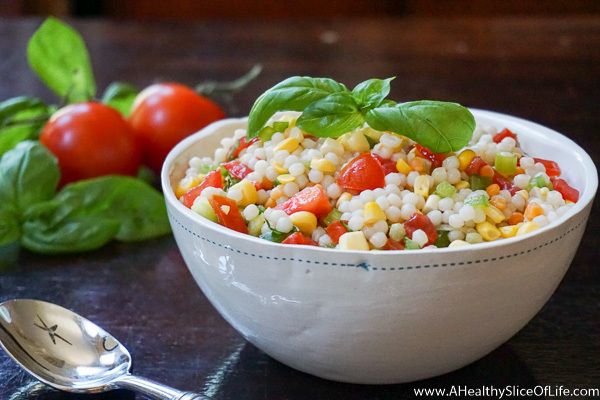 While couscous cooks, prep green pepper, tomato, corn and green onions. Add to couscous as it is cooling and mix well. In a small mixing bowl, whisk together basil, lime juice, olive oil, salt and honey until well combined. Pour over couscous and mix until incorporated. Serve immediately or store in airtight container in the fridge for up to 2 days. 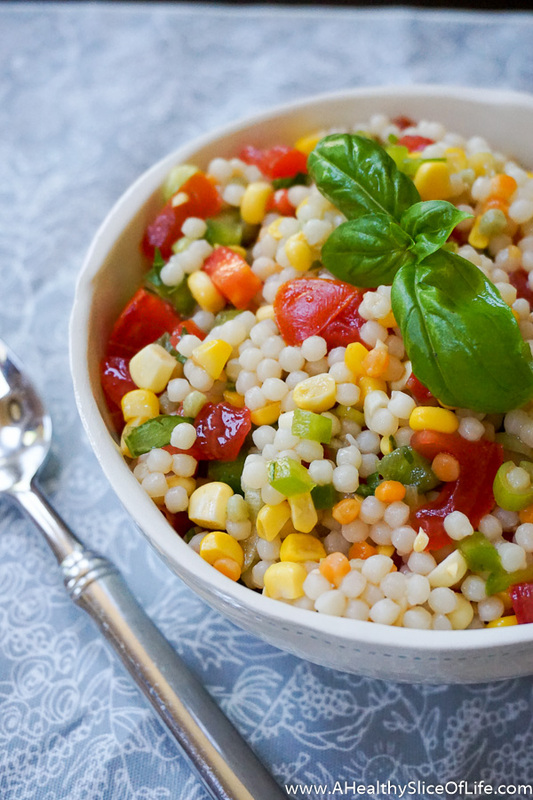 If you like this recipe, you should give my Simple Zesty Greek Pasta Salad a try! Mmmmm… I love me some veggie salad… So good! I made this salad tonight, and it was delicious! I was looking for a light salad to serve with grilled chicken and s green salad. It was light and flavorful. I can’t wait to eat the leftovers for lunch tomorrow! Thanks for sharing!